The photo above was taken about ten minutes before my water broke on Saturday night, December 22, 2018. I was taking mirror selfies and comparing them to previous days to see whether I had "dropped" yet ("no, not really," the photos told me). Alexander's due date was 12/21, the winter solstice. I was born on the autumn equinox, a personal fact that I love, so of course I was stoked for his solstice debut. Statistically, most babies are NOT born on their due date. And so we were a statistic on the evening of the 22nd one day after his due date. It was a full moon so my expectations were high. After doing my photo comparisons, I walked from the bathroom to go ask my husband for a second opinion on the photos when en-route, I felt a warm fluid leave my body. I was pretty sure I wasn't peeing, but it certainly was not like in the movies where a ton of water comes splashing out in a dramatic way. So I wasn't sure. So I went to bed. I woke up at 4am the next day, December 23. It was then that I was sure this was happening because I was experiencing what equated to the worst period-like cramps ever. I woke up my hubby and we called the birth center. They suggested I take a shower to relax and see if the contractions slow down. They didn't! That was a difficult shower! I was having contractions about 3 minutes apart lasting anywhere from 30 seconds to a minute. My husband called my parents who had been planning to drive from Massachusetts to spend Christmas with us no matter what, but were also on-call to try to make it to the birth. We got into the car by 7am, at which point I was having pretty serious contractions. Like, anyone who pulled up next to us at a light and looked over would likely be able to understand what was going on, serious. Like, scene from a movie serious. After arriving at the birth center, and going into our room, everything becomes a bit of a blur. Time made no sense and was measured only in knowing that another contraction was coming no matter what. I remember sitting in a rocking chair for a while and just moaning through it. I had read about "toning", which is using sound currents to help move through the pain. It was explained that the throat is energetically connected to the cervix and that making sounds and loosening the throat would help to also relax and open the cervix. I was 3 centimeters dilated when we arrived and after a few hours of rocking chair, I told the midwife that I was ready for the tub. She filled the birthing tub with warm water and OH MY GOODNESS it was the BEST. It immediately brought me relief. I can't say how long that relief lasted though, because soon enough I was back in the throws of the contractions, though this time they were even more intense. The relaxation of the water seemed to have accelerated my dilation. Something wonderful happened around noon: my mom arrived from Massachusetts. Leaving so early in the morning, my parents made the journey to Delaware in a record 4.5 hours! My mom quickly joined the midwife and my husband in coaching me, holding my hands, and cheering me on. Meanwhile my dad was in the waiting room down the hall. I was the only laboring mama at the center, so my room's door was open and I later was told he could hear all of my toning (I'm pretty sure I was sounding like every animal in the zoo with all of the OHHHH, AHHHH, WAHHHH and such sounds I was making! ), and he was very concerned. He didn't know about toning and when my mom would check on him he was asking, "what are they doing to her in there? 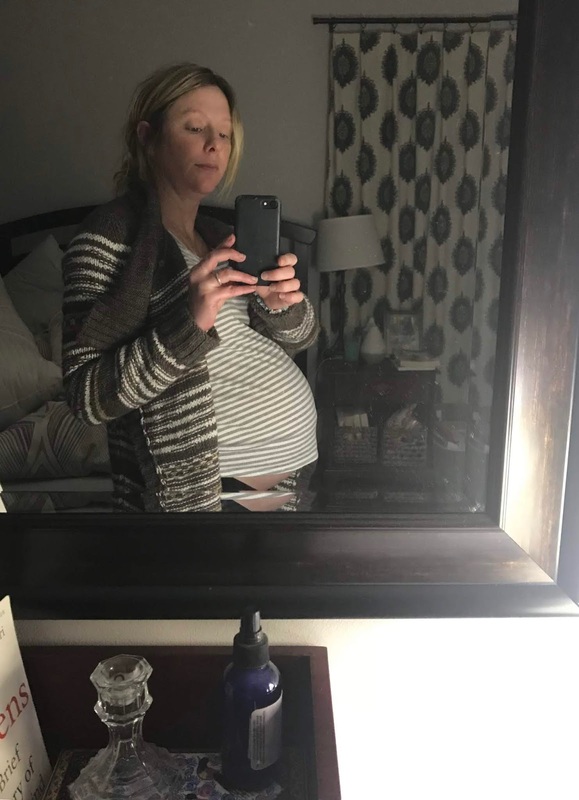 "My mom reassured him that it was just my reactions to the contractions and I was helping to move the process along using a technique I had read about. I believe the combination of the water and the toning worked because from waking at 4am to starting to push at 2pm, my entire labor and delivery lasted just under 12 hours. I'm told this is pretty good for a first baby and my goodness, I cannot imagine going longer. While I had planned a water birth and did spend a number of hours in the water, I actually ended up giving a "land birth". After failing to successfully get into a good position to really bear down in the water, the midwife decided she wanted to move me onto the bed. In hindsight, I have no idea where I found the power to get out of the tub, walk to the bed and start to push again. But I did! With lots of help of course. I believe it was about 3-4 pushes on the bed, lying on my rights side, and then I had my baby boy handed to me. Now THAT was a moment. I couldn't believe it was finally over. What a relief! What a joy! I was so overwhelmed and so glad to have the process over with but I was having trouble to just focus on the baby because of how I was feeling: still in pain. The midwife and nurse did their thing cleaning me and the baby up, cleaning the bed and then getting Alexander to start feeding right away. This was special, he did a great job latching, but I quickly began to notice that my contractions hadn't stopped. Of course not, because there is the afterbirth. This definitely isn't nearly as intense as pushing out a baby, but it's still having to push again, which seemed like last thing in a million years I wanted to do. But I did want it over. So we moved through that quite well. And again I thought, "phew it's over!". BUT...as I was nursing I again started to feel strong contractions. My mom was with me and checked on me and noticed a lot of blood. Rather than tell me about what she saw, she just said she would go and get the nurse. They came into the room and did this awful, terrible, no good thing that I'm sure every woman gets where they press hard on your belly to get any blood clots out. OUCH. I was apologizing as I was swapping the midwife's hands away. It was a biological reaction to hit her but I logically felt bad. 😬 At the birth center, mamas usually go home about 4 hours after birth. The way that they gauge whether you're ready to leave is based on your ability to get up and take a shower. Well, when I tried to get up, I passed out. SO, it turns out I had lost quite a bit of blood via clots and needed an IV of fluids and hormones to both hydrate me and make my uterus contract and stop bleeding. I believe at this point I slept for about an hour while that baby slept in his daddy's arms. I think? I can't remember! (I'll need Costea's version after all!) When I woke up the nurse asked me if I was ready to try for that shower again. With some assistance, I successfully washed myself in what was definitely one of the best showers of my life. I felt so raw. I've always known I wanted to be a mother. Growing up I babysat, I loved up my niece and nephew, and then eventually my friend's children as they came into this world. I assumed my time for motherhood would come naturally, with the grace and ease we imagine most women experience in finding themselves with child. So when I did find my partner and "settle down" and open myself up to be a mommy; and then it didn't happen, I was heartbroken. I know we all hear and read stories about this, and we know it's become more common for couples to wait to start a family, but actually going through this was among the hardest things I've experienced in this lifetime. There have been times in the past where I had no problem sharing my life struggles, epiphanies, and growth through my writing. But something shifted with this situation. For some reason, this was too raw. I was too vulnerable. I was too ashamed. This one thing, that all humans no matter what color, class, race, religion should be able to do, I couldn't. I felt like a failure. Like a fraud. Like less of a woman. How could I share that with anyone outside of my closest, most-trusted circle? I knew I wasn't alone and I read other women's tales seeking glimmers of hope, paths of progress and solutions for acceptance. Sometimes these stories lead to successful pregnancies, sometimes they didn't, sometimes they adopted, sometimes they opened businesses. The key was that I knew I was not alone and yet I felt so very alone. As time passed, a year turned into two years and my fear around the subject grew as I approached and then passed the 35 year-old mark (when I women becomes considered advanced maternal age-ha!) and so we visited a fertility specialist. After some tests and then some surgical procedures, I was diagnosed with endometriosis and told it was highly unlikely I would ever get pregnant on my own. And they had an answer for us: IVF. For me in that time, in a very victim mode, this felt like an incredible injustice. We couldn't afford IVF, not many can! It felt like a stab to the heart, this blessing and miracle that so many experience without much effort, I'd have to find/borrow/steal (ok maybe not that last one!) to experience. But with this being our only option other than adoption, which I quickly also discovered would come with a large invoice, about the same as a round of IVF, we decided to go through with it. And it didn't work. And I was devastated. Devastated. I was sure this was the silver bullet, the thing that would guarantee us our baby. This was a test of all of my personal and spiritual strength. I had to reevaluate everything. What would be next? Adoption? Try again? Do IVF in Mexico? During this time, our marriage was also put through many tests. What could our future look like with no children? What would we do with our lives? Were we even meant to be together? Was this a sign? Fertility challenges for a couple who knows they want a family are so incredibly intense, it is surely one of the biggest life tests/lessons a person could go through. I'm in awe every day of my husbands patience with me. He never stopped believing our child would arrive. By this past winter, I was emotionally spent. My prayer for a solution turned into a tearful prayer for God to take away my desire to be a mom. And after much deep-diving and discussion, we decided to take a break from the "try". To raise the white flag. To surrender. As corny as this may sound, the popular radio song "If it's Meant to Be" came out about this time and spring was just around the corner. It felt right to just let it be. March and April are the most intense months for me at work. I knew I needed to be "on" to run our annual 400-person event, making it a good distraction from our pain. Costea's family would be coming into town for a number of weeks and so we had them to prepare for, and then work with, on our long list of home projects: bathrooms to update, basement to be finished for my yoga classes, and garden to expand to bring us a little closer to our homestead dream. So you might imagine my distraction as one day I realized I was a few days late for my period. This hadn't happened before. Even with my stage 3 endometriosis diagnosis, I'd always had a very regular cycle. I assumed it was from the stress at work and change in schedule from having family staying with us. A few more days passed and on the way home from work one day, I decided to stop at the store and pick up a pregnancy test. I had had a dream months earlier that I had taken a pregnancy test, then another, then another, that were all positive. I could feel the elation from that dream. I remember so clearly that in the dream a Christmas tree was lit in the background. I was shown two pink lines with each test and so that's the kind I looked for this time. I brought it home and found Costea working on the bathroom floor. I took the test, and it was positive. I literally fell to my knees as I showed him the result and we hugged and we cried and we were in total disbelief. Costea never had doubts, it was me that was full of fear and, as I understand it now, impatience. A lesson in patience, trust and surrender. Thank you God, thank you sweet baby being for choosing us! Thank you for answering our prayers in every way, by teaching us surrender and by making our dream of being parents come true. As I write these words I am both full of joy and also painfully aware of the other women and men who find themselves in the same conundrum we lived through for just under three years. There are no words to soothe the pain of not understanding why something so wanted is not happening. All I can offer is the hope from my own experience. That miracles do happen! And so, baby Grozav is coming in December 2018, just in time for that beautifully lit Christmas tree. So far we've made just a few "home improvements". Most of our furniture is the same from our apartment with the exception of a set of bunk beds my parents brought to us from Massachusetts, a beautiful chair I splurged on, and the curtains we bought for our large front window and side window, replacing the awful metal awnings that had been on the house. The bunk beds had been my brother's, then my nephew's, and now they are feeling out their place here. I'd also like to mention that all of our furniture, with the exception of our mattress, is second-hand. Either passed down, donated, or sold to us through family and friends. While every piece may not be exactly what I might "pick out" on a showroom floor, I feel so thankful to have been blessed with pieces that I feel good about and that have stories. We do, of course, look forward to the evolution of our home with time. This post is meant to be the first of before/after posts which hopefully will be sprinkled throughout some other writing, as we're excited to gear up more creative power into beautifying and transformation. I'm really being called to writing again. I've missed it and it's apparently missed me. In that, I am figuring out whether this blog is still the correct medium. Does it need a new name? A makeover? Time will tell! Without further adieu...a few before/after photos! So far here we've painted! (ok, in truth Costea's family came and painted for us, but I did pick out the colors!) What a difference! We were dreaming of a garden the entire two years in our one-bedroom apartment. So this was a MUST and truly our first big home project. We have plans for the coming season to turn over more forested land to field and beds as we hope to start a small-scale specialty farm. More to come on that but we're hoping that in the next 1-2 years this could become part of a full-time gig for Costea. Blue Herons: we love them so much and are blessed to see them fly over our home and during our walks at the White Clay Creek down the road. I've come to calling our home the "Heron Homestead"
Family: Costea's parents made their first visit to us during September & October. We had an amazing time together. His sister Alina came for three weeks in September too! Wishing you all a blessed Winter Solstice and Sacred 2018! Yoga Say What? Learn. Forget. Remember. Bankruptcy of the Pocket or of the Soul?